AGME Automated Assembly Solutions presents its new website, which is much more intuitive, user-friendly and with a more modern and renewed image, in line with its new corporate identity. The information presented on its website, www.agme.net has been updated to put it in line with the company’s main activity, which is the design and manufacture of automatic assembly solutions for automobile components. This reality has led it to change the way it presents its machines, making it easier and quicker to look up information about special machinery by application, component or industry. It has also created two new sections on capacities and technologies, which it integrates into its machines. It thus informs visitors about the way it way of working, its technical and technological capacities, engaging its customers in its working methods and its technological capacity. The technology section includes a new FAQ part, with brief answers to the most common questions that users ask about the different technologies. Its standard machinery also has its place on the website with two sections where the different riveting machines and press models that this manufacturer offers the main manufacturing industries are presented. These sections also include many images, catalogues, technical datasheets and training videos. Based on its clear international vocation and global presence, the new website is in Spanish, English, German and French. This provides all its customers, located in more than 25 countries in Europe, Asia and America, with a better service. On the other hand, in the history section, AGME tells about the more than 65 years that it has been manufacturing assembly machinery, riveting machines and presses. The new communication tendencies and the widespread use of mobile devices have been taken into account to develop this new site. Its design is compatible with smartphones and tablets so as to optimise the browsing experience and make it possible to consult data wherever the user is, without any type of restriction. 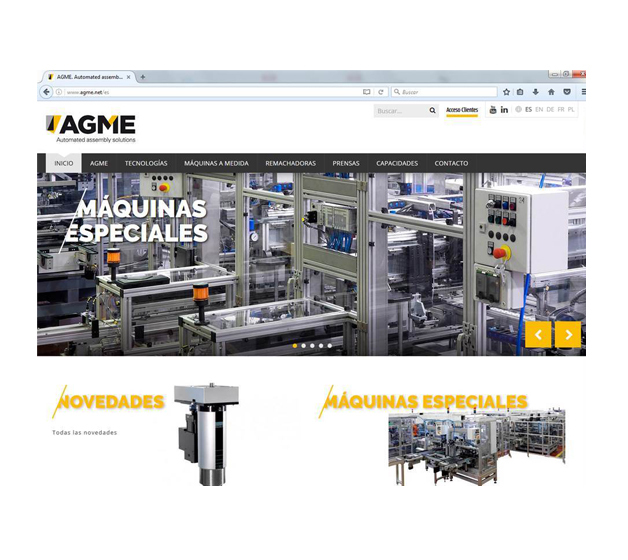 In short, with this new website, AGME reinforces its positioning as a global supplier of automatic assembly solutions, making it possible for any user profile to search for information and offering content with updated technical information and images.